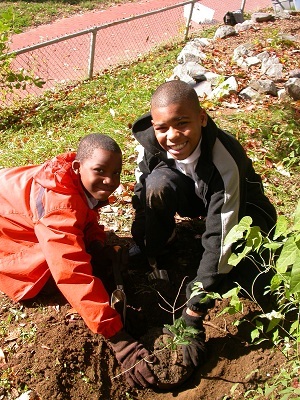 In 2008, Lands and Water partnered with Living Classrooms of the National Capital Region. This partnership has helped expand our conservation projects throughout the Metropolitan area. 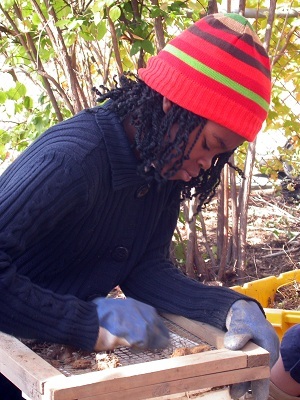 Living Classrooms provides excellent hands-on instruction while Lands and Waters designs and directs greening projects on school grounds. Maury is one of several schools in DC that has benefited from our partnership. An eroded slope on school just before project on school grounds. 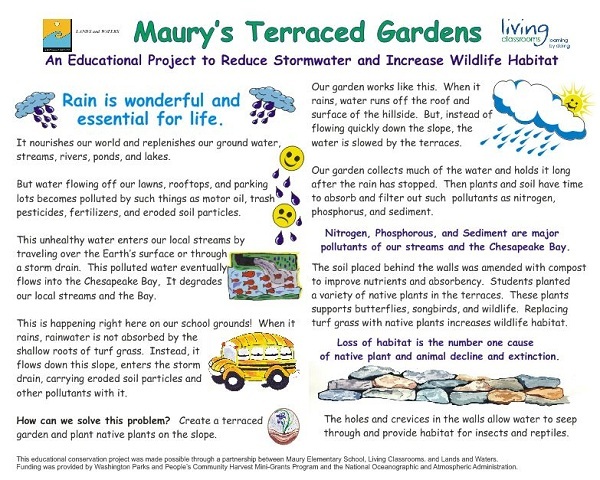 Maury’s greening project focuses on stormwater management and habitat development. 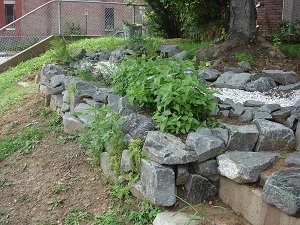 The picture below shows an eroded hillside on the school grounds. In order to reduce and filter stormwater runoff, stop erosion, and provide wildlife habitat, Lands and Waters created a series of rock walls and backfilled behind them with amended soil. The rock walls were created without concrete which allows water to flow from one terrace to another. The “weep walls” slow down the water flow while the backfilled areas provide absorbent spaces to collect and retain water. Students planting in terraced garden. Student screening soil to be amended. 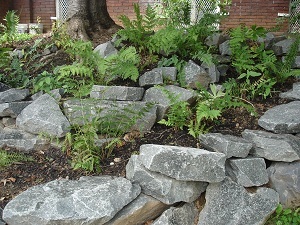 The terraced garden was planted by students to assist in the retention and filtering of water. A wide variety of native plants were planted to increase native plant diversity and provide wildlife habitat. The “weep walls” are attractive habitat to insects and small mammals. Native plants during summer of 2009. Educational sign designed by LANDS and WATERS.